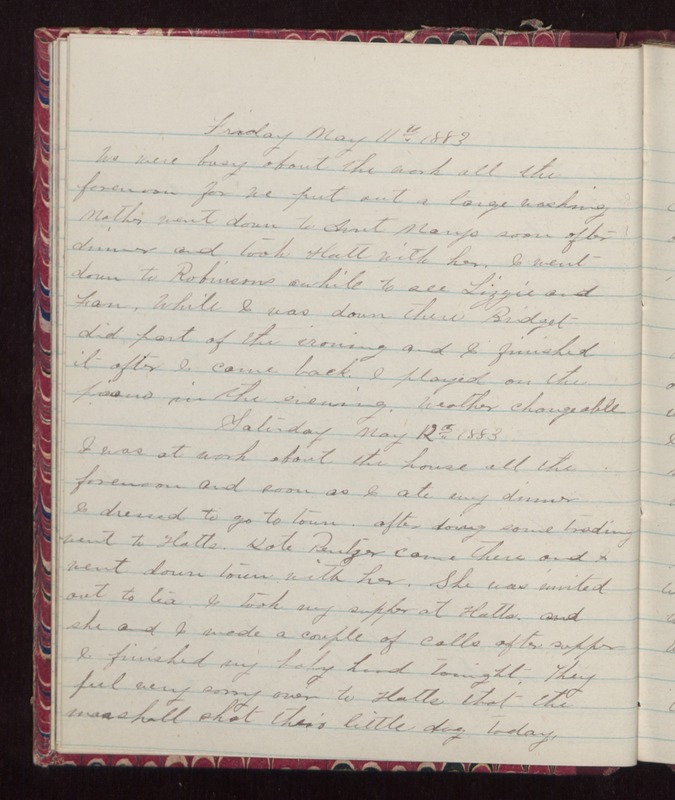 Friday May 11, 1883 We were busy about the work all the forenoon for we put out a large washing Mother went down to Aunt Marys soon after dinner and took Hatt with her. I went down to Robinsons awhile to see Lizzie and Fan. While I was down there Bridget did part of the ironing and I finished it after I came back. I played on the piano in the evening. Weather changeable. Saturday May 12th 1883 I was at work about the house all the forenoon and soon as I ate my dinner I dressed to go to town, after doing some trading went to Hatts. Kate Pentzer came there and I went down town with her. She was invited out to tea. I took my supper at Hatts, and she and I made a couple of calls after supper I finished my baby hood tonight. They feel very sorry over to Hatts that the marshall shot their little dog today.